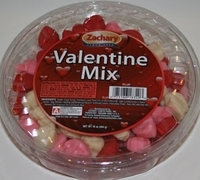 Mellowcreme mix in an assortment of cupid, angels, heart and lips in red,white and pink colors for Valentine's day. This is one of the classic candies that are a must have for the holiday. Not only are this great to place in your candy dish, but Valentine mellowcreme candies are one of the most popular sweets used for decorating you holiday baked goods. Each tub is 15 oz.